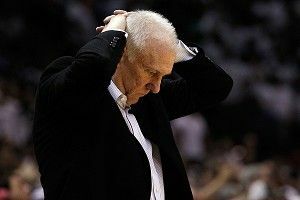 » What Adjustments Do the Spurs Need to Make? Everyone expected an exciting Western Conference finals from the San Antonio Spurs and the Oklahoma City Thunder, and they have not disappointed. The Spurs looked untouchable on the offensive end through Games 1 and 2, executing to perfection and scoring at a shockingly efficient rate. OKC’s Scott Brooks responded in Game 3 with a defensive adjustment to seize control of the series and get the Thunder three consecutive wins. The two teams return to Oklahoma City tonight and, down 3-2, the Spurs must make the adjustment now. All season long, the Spurs have won with their offense as opposed to relying on defensive stops. They need to find their rhythm again, and if Game 5 was any indication, they are improving. San Antonio relies on their successful pick-and-roll play, and there are two key adjustments they can make here. First, they need to use the pick-and-pop, regardless of who is setting the screen. The Thunder try to trap Tony Parker (or Manu Ginobili if he is the ball handler) as soon as he comes off the screen, which leaves the screener — Tim Duncan or Boris Diaw — open. The Thunder can live with either of those guys getting the ball over Parker/Ginobili driving into the paint, which can also lead to a kick-out corner 3. The Spurs need to come out and knock their shots down. If Duncan can make his shots, the defense will have to guard him more closely. Then the hedges dedicated to Parker and Ginobili won’t be as strong, the defense will have to make rotations, and new cutting lanes will open up. If you can make Duncan a shooting threat, there will be new pressure on the Thunder’s defense. Pick-and-pops also serve to exploit a weakness of the Thunder’s bigs, which San Antonio began to figure out in the last game. The Spurs need to prevent the guys who are hedging from getting to their spots by getting them moving before the actual screen is set. The Spurs attempted this with two different strategies in Game 5, both of which were pretty effective. Usually the Spurs use the same screener on multiple screens, but here they used two different screeners. This worked because it prevents the defense from preparing for the pick-and-roll. As Parker comes off of the original ball screen, Nick Collison hedges out to corral Parker. But because his man, Boris Diaw, sets the ball screen and clears out, Collison can’t commit to the hedge. He is forced to return to his man. Next, Duncan steps up and sets a ball screen for Parker. Kendrick Perkins, Duncan’s defender, wasn’t prepared for this, so he can’t keep Parker out of the paint. Parker draws the foul and goes to the free throw line. Another effective way to get the Thunder’s bigs on the move is to use a screen-the-screener strategy in which the Spurs set an off-ball screen for the player who will eventually set the ball screen. In the video above, Perkins is out of position as Parker comes off of the screen. As result Parker gets into the paint, forcing Russell Westbrook to come over and help, leaving Ginobili open. Parker finds him for an open 3. Ginobili misses, but this is a good attempt for them. The second time, Parker is able to get all the way to the rim and take his signature floater. Again, the shot doesn’t fall, but this is the kind of attempt the Spurs want. If San Antonio can execute these changes, they could still win the series. They began to find their offensive rhythm in Game 5. Now they just need to make their shots. If they can do it, I wouldn’t be surprised to see them take Game 6 tonight and Game 7 on Friday.